Warrick traces how the strain of militant Islam behind ISIS first arose in a remote Jordanian prison and spread with the unwitting aid of two American presidents. There have been a number of previous biographies of Zarqawi, but Warrick takes the story much further and deeper. Most important, he shows, in painful but compulsively readable detail, how a series of mishaps and mistakes by the U.S. and Jordanian governments gave this unschooled hoodlum his start as a terrorist superstar and set the Middle East on a path of sectarian violence that has proved hard to contain ... What makes Warrick’s book unique is its focus on the group’s roots, especially the evolution of its founder. Warrick’s account centers as much on American missteps as it does on the jihadi long game to build capacity. He telegraphs his disgust with ISIS without turning his book into a two-dimensional jeremiad and takes pains to include accounts of the group’s thinking, evolution, and internal political disputes ... Most bracing of all is Warrick’s historically-grounded corrective, which blames the American invasion of Iraq in 2003 as the single most pivotal factor in the organization’s creation. Mr. Warrick has a gift for constructing narratives with a novelistic energy and detail, and in this volume, he creates the most revealing portrait yet laid out in a book of Abu Musab Al-Zarqawi, the founding father of the organization that would become the Islamic State ... The final chapters of this volume have a somewhat hurried feel ... 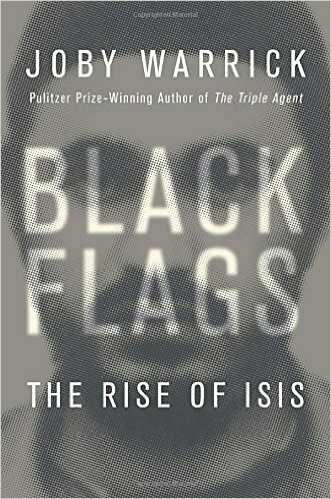 But for readers interested in the roots of the Islamic State and the evil genius of its godfather, Abu Musab Al-Zarqawi, there is no better book to begin with than Black Flags. What did you think of Black Flags: The Rise of ISIS?